Managing your blood pressure shouldn’t be stressful; the Beurer BC80 Blood Pressure Monitor is like a stroll in the park. If you suffer with frequent headaches, tinnitus (constant ringing of the ears), dizziness and nosebleeds but you’re unsure why, you may have high blood pressure. The only way you can be 100% certain if you do is to get your blood pressure checked. But that can sometimes be a lot more stressful than it needs to be. Booking an appointment, travelling to the Doctor’s, sitting in the empty waiting room for 15 minutes until you see the nurse; all for a quick 5 minute blood pressure reading. Wouldn’t it be easier if you could take your reading in the comfort of your own home? Well now you can, the Beurer BC80 blood pressure monitor allows you to manage and keep track of your blood pressure all at home – you won’t have to get out of your pyjamas! With the Beurer BC80 Blood Pressure Monitor taking your blood pressure is smooth sailing; it’s so simple to use and you get accurate results quickly. The large LCD display allows you to read your result extremely clearly and if there is any sign of an irregular heart beat (arrhythmia), the arrhythmia detection will signal a love heart symbol to notify you. 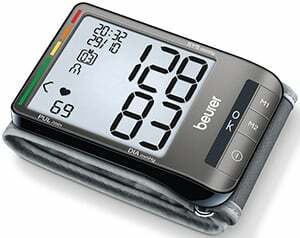 The WHO (world Health Organisation) traffic light indicator that is incorporated in the Beurer BC80 Blood Pressure Monitor allows your reading to be even easier than ever before; it indicates and categorises your blood pressure according to the World Health Organisation’s classification of Optimal, Normal, High Normal, Mild Hypertension, Moderate Hypertension or Severe Hypertension. This monitor is also a great way to check for low blood pressure (anything under 90/60). Symptoms of low blood pressure include nausea, vomiting and even fainting so it's a good idea to know your numbers so that you can rest and avoid unpleasant events. What’s also great about this wrist blood pressure monitor is that it stores your average readings from morning and evening of the past 7 days, so you can measure and compare your blood pressure every day of the week. The wrist blood pressure monitor is also compatible with the Beurer Health Manager; this downloadable software allows you to get the most out of your health management if you want to improve your health. The software collates your data into readable and understandable graphs so you can analyse your progress and better yet, see how you’re improving. The wrist cuff fits up from 13.5 – 23cm which you can adjust to fit you securely; it also has inflation technology so it measures your blood pressure quickly and comfortably; just like the one at the doctors!